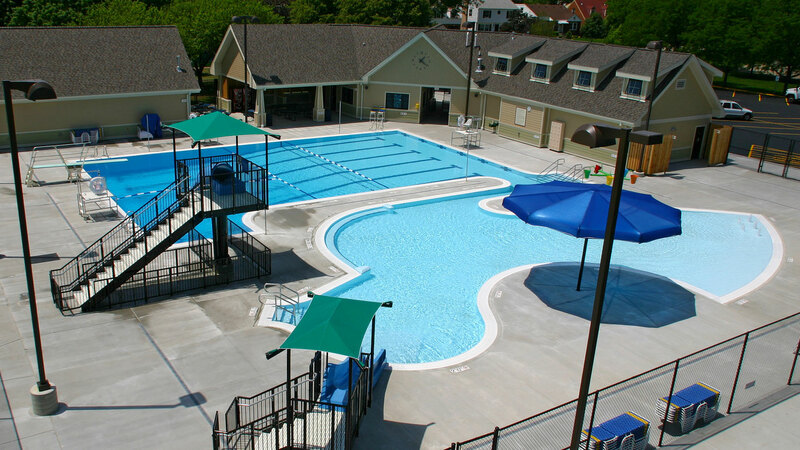 The Des Plaines Park District commissioned Cordogan Clark to design and develop a new modernized aquatic center to replace the existing Chippewa Pool. The design of the new re-programmed facility accommodates a bather load of 500. Our team worked closely with the park district to design a facility that was economically, environmentally, and socially sustainable. Elements incorporated into the new pool also reflected the communities request for a facility that would fit into and meet the needs of the neighborhood. The combined lap and leisure pool features zero depth entry with a fumbling five, an omnipod with five tipping buckets that fill up with water and randomly spill, a tot slide, and underwater bench seating area. The 6-lane by 25-yard lap area, which is connected to the leisure area via a small walkway, includes a one -meter diving board and drop slide. The aesthetic design of the site and facility, including the selection of planting materials, the pools and slide, and support buildings, blend contextually with the natural environment established by the existing neighborhood.